Don and I are embracing some new philosophies and making some lifestyle changes. Some of you have heard a bit about them – you could skip down to the first picture if you don’t want a recap. For those that haven’t heard the story, it all started with a movie (comedy-documentary) we watched on Netflix back in February. It was called FatHead and it said some interesting things about nutrition. Next came, Sugar: The Bitter Truth. (Thanks Kevin!) We were intrigued and concerned about some of the things we learned. We’d heard a bit about the Paleo Diet but suddenly we were paying closer attention. We’ve purged our pantry and fridge of any foods with high fructose corn syrup, and cleared out the bread, pasta, beans, and rice. We’ve still got a long way to go to finding replacements for a lot of things but so far the journey has been good. We are eating more meat, eggs, veggies, and fresh fruit and we feel great! When we made the first initial leap and started cutting back on the sugar and carbs, Don lost about 15 lbs and 5 inches on his waist – in three weeks! This is not just another gimmicky way to lose weight. It’s not even really about losing weight, although Don does want to lose a few pounds. It’s really about a fundamental change to our overall, everyday diet/nutrition. It’s about changing the way we think about food and learning that all the things we’ve always thought about nutrition are not all that correct. It’s not just about calories despite all the media focus on calories. Or if nothing else, check out the Primal Blueprint Food Pyramid. Very different. 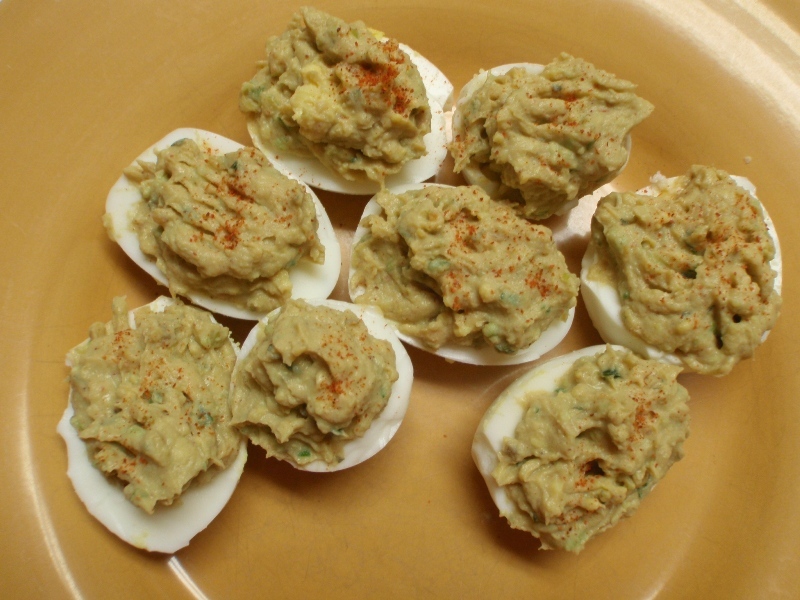 Check out our Avocado Deviled Eggs! It’s a science of flavoring to taste and since Don is the cook and doesn’t use measurements much I don’t have exact measurements for you. But it gives you the idea. We paired it with a salad of arugula and spinach leaves with tomato. 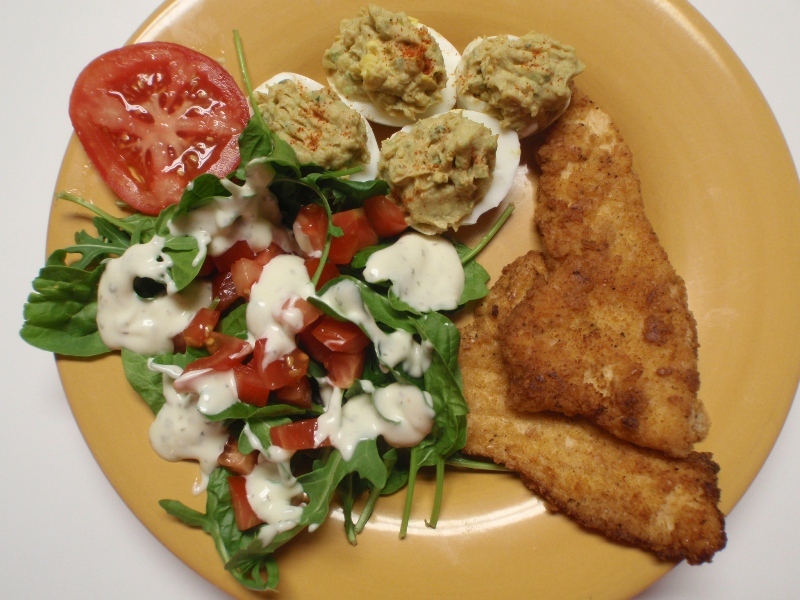 There’s a bit of Marie’s All Natural Creamy Ranch dressing, http://www.maries.com/maries-difference.aspx?nav=top, and before you say it, yes I know it has a little bit of sugar in it. I never said we are cutting sugar out completely. We are paying better attention to ingredients and we are making an effort to limit the sugar intake considerably. Unfortunately, I can’t tell you how Don breaded the fish. It was something he put together by scratch. I promise to pay closer attention in the future. I realize it’s a bit useless to show you something and not tell you how you can do it. 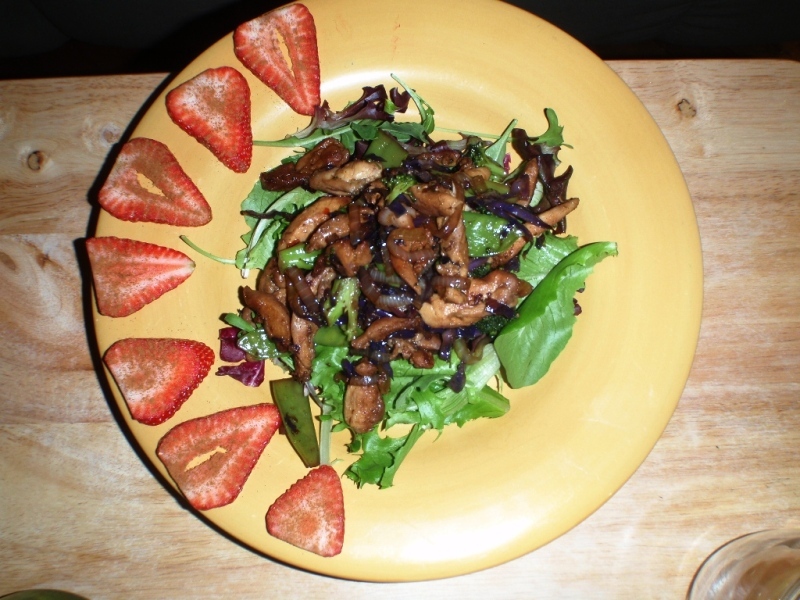 Earlier in the week we made a chicken stir fry (right picture) that we served over a spring mix salad. Don sautéed the chicken with onions, cabbage, and snow peas, and the strawberries are sprinkled with cinnamon. I’m having the leftovers for lunch today and I can’t wait! I know, you foodies out there are going to beat me up for not including details on the seasoning. It’s hard when you’re not the one cooking and I’m in the cook’s way if I hover to try to track what he’s doing. I’ll find a way and I’ll get better with my food posts. I promise. 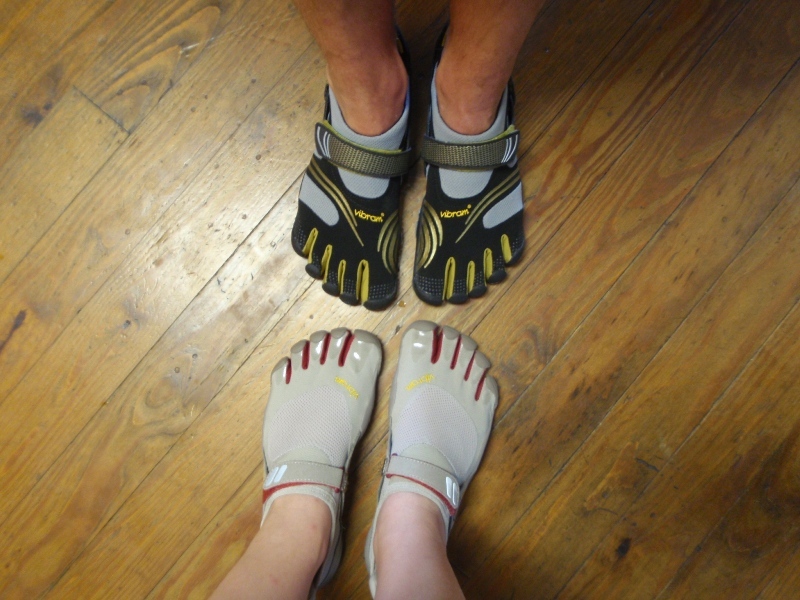 On a different, yet sort of related note, we bought Vibram FiveFingers shoes last night. We wore them a bit last night and they are quite comfortable. We are eager to see how they will fit into our fitness routine and how much of a difference they make in the way we walk/run. I will give you an update and a more thorough review once we’ve had them for awhile. That’s it for today! I know it was a long post. I hope you stuck with me through the beginning so you could see the new things we are doing. We are excited about the changes and looking forward to finding new ways to prepare food, and a new approach to our health and fitness. I also look forward to sharing our successes (and maybe some failures) with you as we explore this new territory.